We took the time to track down the highest quality handbags made in the USA. 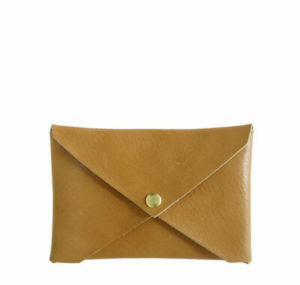 We outline them below, split up into different categories like flap bags, envelope style bags, cross body, and more. Check out our top recommendations below, along with a ton of details about each one, our opinions, where to get them, and the factors we considered in our research. After hours of research, we found some of the best domestically made handbags available today. We were impressed with the unique strength and beauty of a lot of brands, like recycled Sea Bags, Foldover Clutches from K. Slade Brooklyn, or the reliability and class of the Weekender bag from Kámen Road. Read more about our top picks below. Here are deeper details on each of our recommendations, along with what we liked and didn’t like about each one and where to get them. The Archive Tote Bag from Jenny N Design is handcrafted with incredible care. The bag is made from full-grain cowskin leather and lined with a water resistant canvas inside, which helps protect the bag against unexpected spills or moisture. We love that the style is simple and timeless. This bag snaps or zips shut on top and has two exterior pockets, one that zips shut in the back and a snap-close pocket on the front of the bag. We found the bag to be super easy to carry as well, with 12 inch hand straps and a 44 inch adjustable shoulder strap. Overall, this is a phenomenal everyday carry with timeless style. Be sure to check out our guide on American made leather bags and briefcases as well. For lightweight style and long-term storage durability, the Stephanie Dawn cotton handbags make beautiful accessories for any occasion. 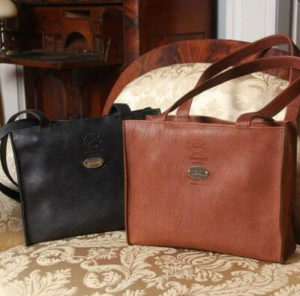 The bags come in a wide range of shapes, styles and colors giving you plenty of options to choose from. We love that this lineup of bags is produced exclusively in America and that the founding company has more than 27 years of manufacturing experience with quilted cotton bags. “We choose to make our products here in the USA because we provide jobs to our local community in the Van Wert, OH area,” says the team at Stephanie Dawn. “Our customers love the high-quality of our products, the fact that they are made in the USA and they help support not only our business, but jobs to our wonderful team of employees!” We couldn’t agree more. These versatile bags can be made to match any style. Made from top quality heritage American leather, the Hugo Flap bag is a stylish accessory for upscale or casual use. This carry bag comes in nine different dyed finishes, making it easy to choose a color that appeals to you. We love that each bag is guaranteed for a lifetime of use. This bag features interior and exterior pockets and is held together with tough brass closures. It features a closure that turns and locks for secure carrying. 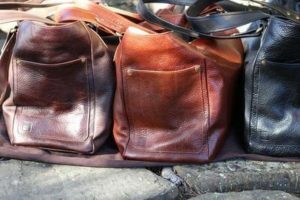 These bags are made with old-fashioned dye techniques for a more natural look. Each bag can be personalized with an embossed monogram for free, making this bag into a nice gift option. Bring a piece of American history with you to the beach with one of these one-of-a-kind sail bags from Sea Bags. These bags are hand-crafted from recycled sails taken right from boats in Maine. Material for each bag is sourced from Maine or other locations around New England when possible, and always from the United States. President and COO Beth Shissler explains it well: “We built the company around making our product here out of recycled sails. Every time a customer buys a Sea Bag, they are not only saving a sail from the landfill, they are supporting jobs. From the people who sew the bags, to the people who make the ropes in our handles – there’s a ripple effect of support. 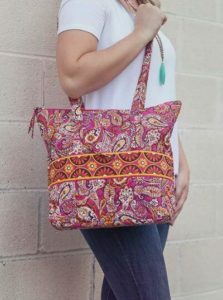 I think our customers appreciate the authenticity of our product and our mission.” These bags show off unique designs and styles, giving you a stylish, hand-stitched look made right here in America. For lightweight carrying, the Origami Envelope bag from Blair Ritchey is a high quality option that’s durable and classy. We like that the bag is made from vegetable tanned leather and that it has a smooth, but tough feel to it that will hold up through years of use. The bag comes with a classy bright brass snap closure that firmly locks into position. 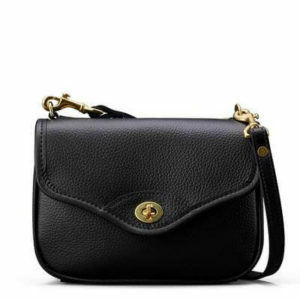 Use this compact bag to carry credit cards and cash, or slip it into a larger purse to neaten up a little bit. Add on a D-ring or pom pom accessory to change the look and function of this bag. Classy and compact, the K.Slade Brooklyn Foldover made our list because of its looks and function. This lightweight bag is ideal for carrying credit cards, cash and other essentials. 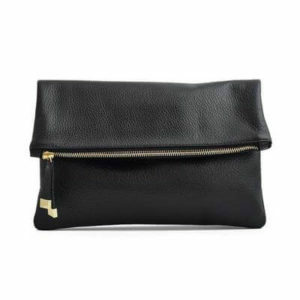 The foldover is just a single pouch that’s pebble black leather on the outside with a light cream colored liner on the inside. We like contrast between the deep black leather exterior and the brilliant gold zipper and pull. The bag is 100% made in the USA and it can be customized with a small monogram in the lower right corner during purchase for a small added cost. We like this bag for everyday carrying inside a larger bag, or for lightweight use when you want to travel light. 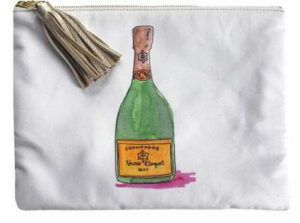 Carry a piece of art with you wherever you go with one of the Artists Collabs bags from Beau & Ro Bag Company. 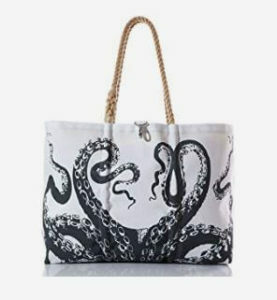 Each of these unique bags features a piece of art to really demonstrate their style. The bags are actual collaborations with local artists and they offer ample storage space for most everyday carry needs. We like that some of these bags come made from a water-resistant nylon material that’s good for use at the beach or the pool. Some of these art-bag options are also made from durable canvas for tough performance. Crafted from fine dry milled leather, the Wayfarer Tote from Colonel Littleton is tough, stylish, and a reliable everyday carry for women that value style and reliability. The bag features a magnetic closure that locks it firmly in position. We like the mid-sized form-factor of this bag. At just 9” tall and 12” wide with a 4” depth, this bag will hold most essentials without being overwhelming. Pair it with a few small storage containers and keep everything neat and organized. This bag uses thick stitching, which is evident in every section of this American produced product. Designed for lightweight travel, the Weekender from Kámen Road is a stylish bag that holds just enough to get you through the weekend. This pack is made from natural tan leather or black leather and features bridle leather on the bottom and the straps for maximum strength. We love the unique full grain leather look and the tough stitching around the edges of this bag. We talked to Kathleen Murphy at Kámen Road who summed up their production process well: “Natural material is what we search with fair trade suppliers now. Our goal is to work with regional supply chains across the United States that includes artists, artisans and small scale producers.” Now that’s a message we can get behind. At 13” tall and 15” long, this bag will easily accommodate your makeup, clothes, tablet, and any other short-term essentials when you leave home for a day or two. “We want each bag to carry what you love the most. ‘Made Here. For You’ is what we say and what we’re so very proud of,” says Murphy. Skip the roller suitcase and travel in style with this high quality bag. Be sure to check our our full Kamen Road interview as well. 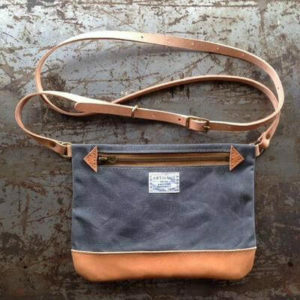 Lightweight, distinctive, and versatile, the Cross-Body from Artifact is a high quality everyday carry bag. “In 2010, Artifact was started in my basement with one sewing machine,” says Chris Hughes, founder of Artifact. We added this particular bag to our list because it’s designed for simple performance and is offered in a tough waxed canvas for water resistance and strength. We love that this bag is offered in several different material types, but prefer the strength and look of waxed canvas the best. It is held together with mil-spec thread and cotton webbing for strength in a lightweight package. There is clearly a ton of care that’s put into the construction of these bags, which was a big consideration for Hughes when he decided to make his bags in America. “I chose to make our products in my home town of Omaha because I needed to ensure everything is made to our standards,” says Hughes. This compact bag is good for carrying your cards, wallet and phone, but should be paired with a larger bag for all-day use. 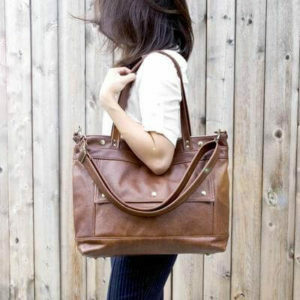 It comes with an adjustable leather strap, for a comfortable carry position for everyone. Most important of all, we judge the bags by style. Handbags should be fashionable and pieces that you’ll be happy to carry around. Since everyone’s style is different, we chose a wide variety of colors, materials, and constructions to make sure we covered a wide variety of preferences. We chose classy leather bags, artistic prints showcasing unique art, chic canvas bags decorated to perfection, and pieces that stand out compared to other bags you’ll see today. Nice looking bags are important, but durability is equally crucial. We looked for bags made from tough materials like canvas, sail cloth, nylon or leather, and we also look for tough metal hardware and thick stitching to hold it all together. Attention to detail is important when judging the quality of a bag. The highest quality products all show off exact manufacturing practices. Clean and organized stitches hold everything together. A good purse or handbag should be crafted to exacting standards. We also looked for defects to make sure we didn’t find any in our top recommendations. Notice we didn’t say cost here, and instead said value. Some of the bags we featured are expensive, but they are worth the cost. We looked for purses and other bags that are affordable for the everyday woman and are going to last a long time.